Patent documents often do not contain an assignee name. Blank assignee names are more common in patent applications than granted patents. In some cases, AcclaimIP guesses the assignee for you. We can guess names with a high degree of accuracy by analyzing inventor names, agent names, locations, dates, and technology classes. AcclaimIP allows you to search the guessed assignee name by using the ANG (Assignee Normalized Guessed) field code. Note that the Assignee (Current) field contains both the guessed assignee name and the canonical (not guessed) assignee name from the ANC field, when they exist. Also, a name may change from a guessed variant to a canonical variant in cases where an anonymous patent application is granted with an assignee name. AcclaimIP will update the current assignee field of the application with the official name. ANG:(Apple Inc) NOT ANC:(Apple Inc) --> Displays ONLY the guessed variants of Apple Inc. This is one of our analysis fields that just says: "This is a guessed assignee." We will go into this query field more later in this help manual. In your search result window, if the assignee name is guessed, the name appears with a leading asterisk ( * ) in the Assignee (Current) column. 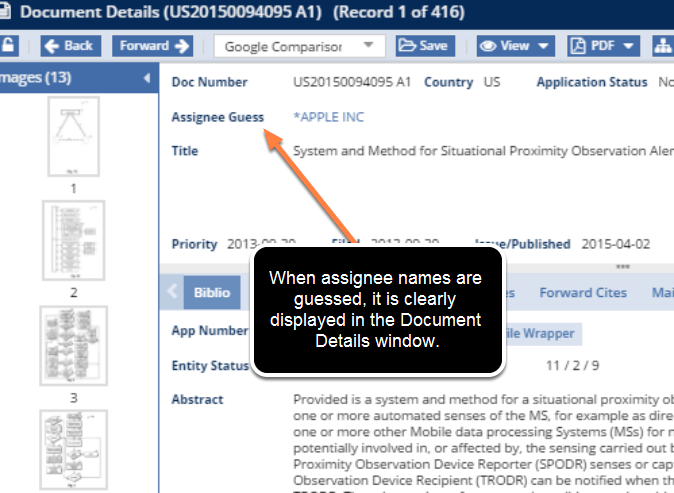 Any guessed assignee names will also show up in the Document Details window. The Document Details window will clearly alert you that the name is a guessed assignee name both by the leading asterisk and by using the Assignee Guess field. 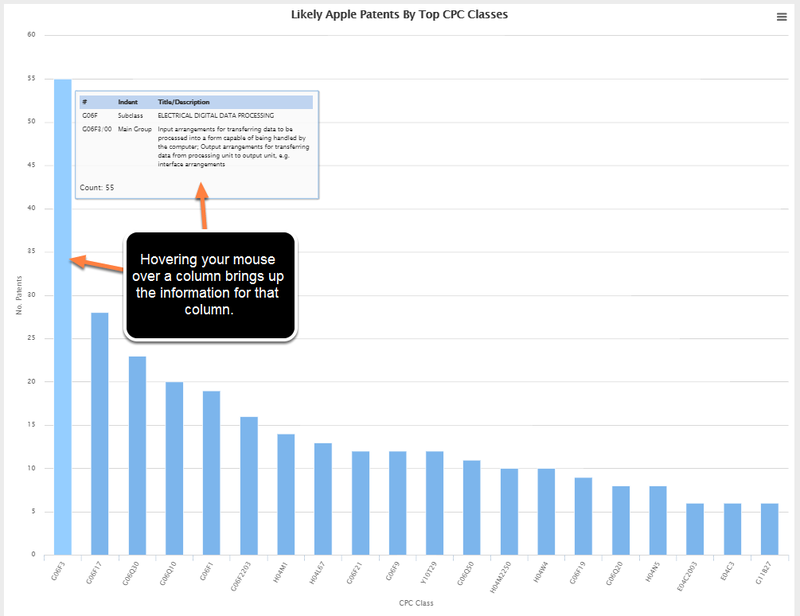 This query shows only patents with no canonical assignee name, but AcclaimIP's guessing algorithm determined they likely belong to Apple, Inc. I then charted the top twenty CPC classes from the search. If you need more information about that class, you can hover your mouse over the column to get a pop-up. Additionally, you can click on a column to take you to a search results window with just those results. For example, in the chart below, clicking on the far left column will show me a search results window with only those fifty five documents.